The Cumberland Trio is now in its 50th year of existence. Recently an old reel-to-reel tape copy of its May 1964, New York City Recording sessions at storied Gotham Studios was discovered after a 49 year search. 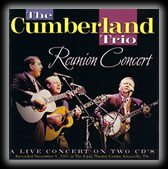 The album was digitally remastered to CD and represents The Cumberland Trio’s best studio work of the 1960’s Folk Era. The Double CD "Back Where We Began" includes a complete set list of 29 songs, many of which will be performed by the Trio on June 17 at Riverbend. The Double CD was recorded live and the Trio is proud to be debuting them at Riverbend!